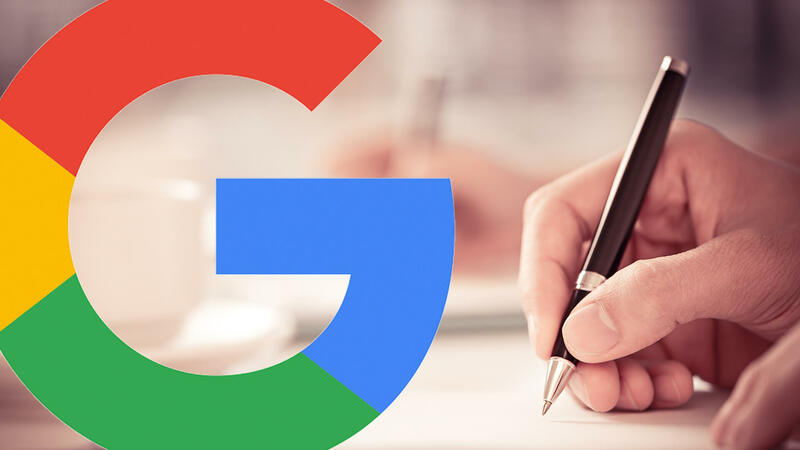 Google has been testing a new content platform called “Posts with Google,” and it could have a huge impact on brand searches, for both paid and organic. We all know that Google has had its struggles with trying to develop its own social network; Google Buzz is dead, and Google Plus seems to be on its way out. This new platform seems to have some social elements to it, though it is very different from a social network. Every day millions of people search on Google, many of whom are looking for information about prominent individuals and organizations. Now we’re experimenting with a new way for users to hear directly from select entities they’re searching for on Google. Verified individuals and organizations can now communicate with text, images and videos directly on Google. Creating content is fast and simple, and once published, posts will appear instantly in search results related to the publisher. Each post can also be shared on popular social networks. So it appears the goal for this platform is to provide real-time updates from individuals and organizations when someone performs a direct brand search. This complements Google’s Knowledge Graph results, which provide quick information for entities. Google was already doing this real-time update by having official Twitter profiles and a tweet feed appearing for searches for entities. Let’s take a look at the platform. Check out the Tory Burch profile on posts.google.com. As you can see, it resembles a company social network profile page. It has a post feed, profile photo and what appears to be a cover photo/banner. 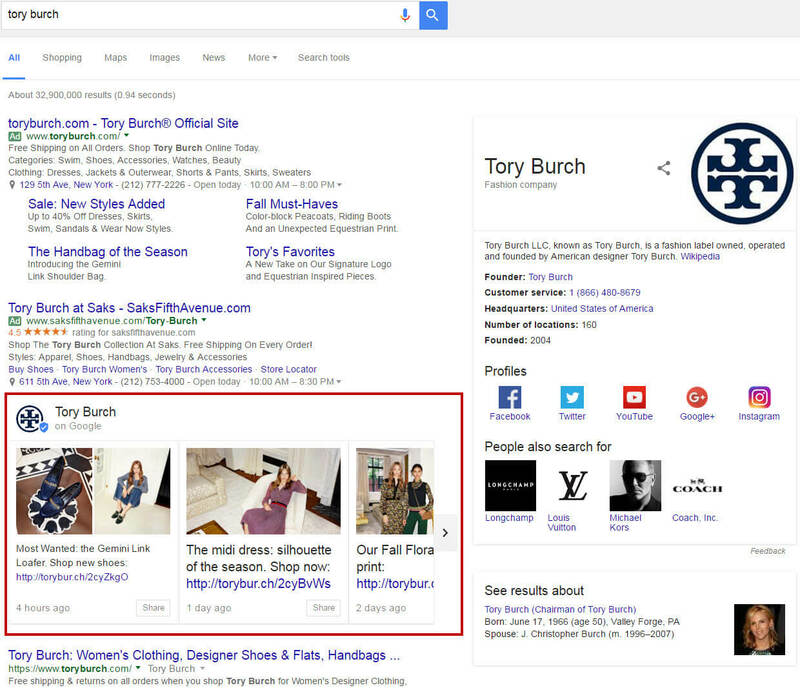 The Tory Burch content feed is also appearing for branded searches. Notice the content carousel that sits below the paid ads and at the top of the organic search listings. 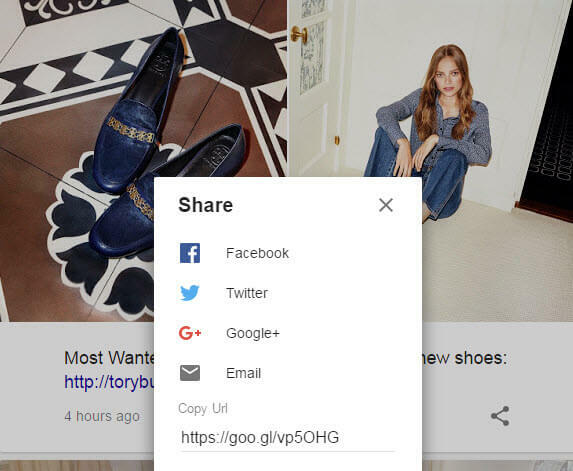 This platform has a strong social integration as well; social share buttons are prominent on the profile and in the content carousel that appears in the SERPs. This podium feature is still experimental, and right now it’s “invite only.” But if Google opens this up to more individuals and brands, it will have a major impact. 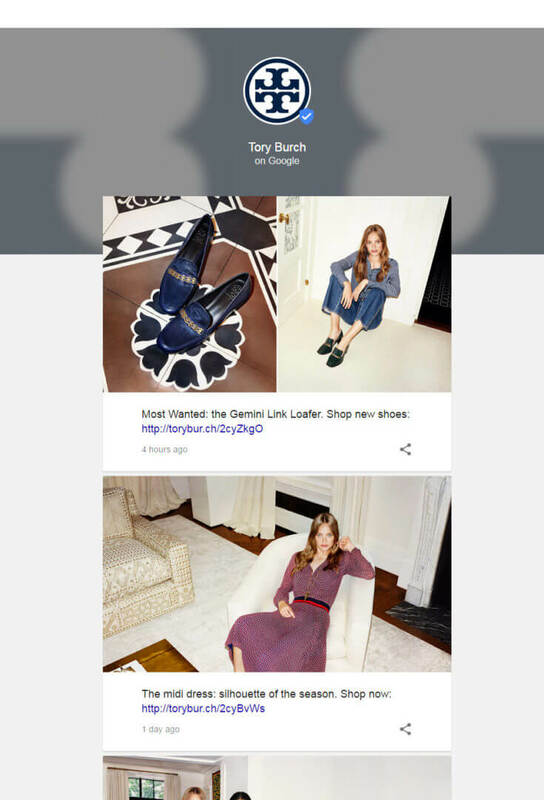 As you can see in the Tory Burch content carousel above, the Google Posts content is very prominent and includes links, images and videos. This type of result can steal clicks from both paid ads and organic results. However, this is not necessarily a bad thing, as the links within your posts can direct users to your website, which can save you budget on the paid search side. From a conversion standpoint, this platform allows you to post real-time updates, such as sales or promotions, which can help increase conversions on your site. This can also help distract users from negative results that may be present on page one of your branded search results. It would be interesting if Google provided reporting metrics for this result type, such as organic impressions and clicks in the Search Analytics Report via Search Console (as they currently do for web pages). At this point, we have to wait and see what Google decides to do. There is currently a waitlist to use this platform, and I would highly recommend signing up if you are representing a brand or business. Visit the signup page here. Tony Edward is a Senior SEO Manager at Elite SEM and an Adjunct Instructor of Search Marketing at NYU. He leads the SEO team at Elite SEM’s New York City office. Tony has been in the online marketing industry for eight years. His background stems from affiliate marketing and has experience in paid search, social media and video marketing. Tags:All Things SEO ColumnChannel: SEOGoogleGoogle: Google PostsSEO - Search Engine OptimizationSEO: General.